I set up my telescope and Canon T5i on the Orion EQ-1 mount (with motor attachment) on my back patio. 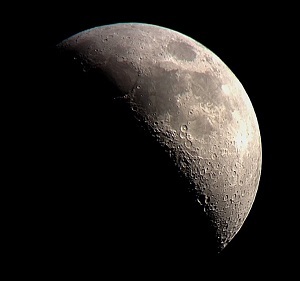 It was a super clear night, and nice and dark with the exception of the waxing gibbous moon. I attempted to take a long stack of images for Andromeda, since last time was just a test with 14 light frames. Patio setup, complete with candle and coffee. Tripod just barely on the patio to spot Polaris. With my camera and tripod on the very edge of my patio, Polaris is just barely visible above the roofline. We're talking JUST BARELY - here is a photo to prove it, you can see the blurry gutter in the foreground! Polaris just barely visible over the roofline with a blurry gutter in the foreground, but I was able to keep my tripod on firm concrete without going into the yard. I tried to slew to Andromeda and ran into a little problem. Actually I ran into the motor with this little metal pole on the side of the mount. It's the casing for the declination slow motion control screw rod thing. I messed with it for a little bit, but the cold was getting to me so I moved on to select a new target. EQ-1 motor getting in the way! In hindsight, all I had to do is turn the declination axis around 90° to point the screw casing the other direction and let the smaller side pass by the motor. Another solution would be to spin the RA axis around the other way and turn the camera upside down - there are lots of ways to get to where you want to go on the sky but they're not always easy with a camera viewfinder. I took stacks of both the Pleiades and the North America Nebula. the North America Nebula (NGC 7000) easy to find but tricky because it's not in my Stellarium catalogue. It's very close to Deneb (a bright star in the Summer Triangle) so in that sense it is very easy to find. 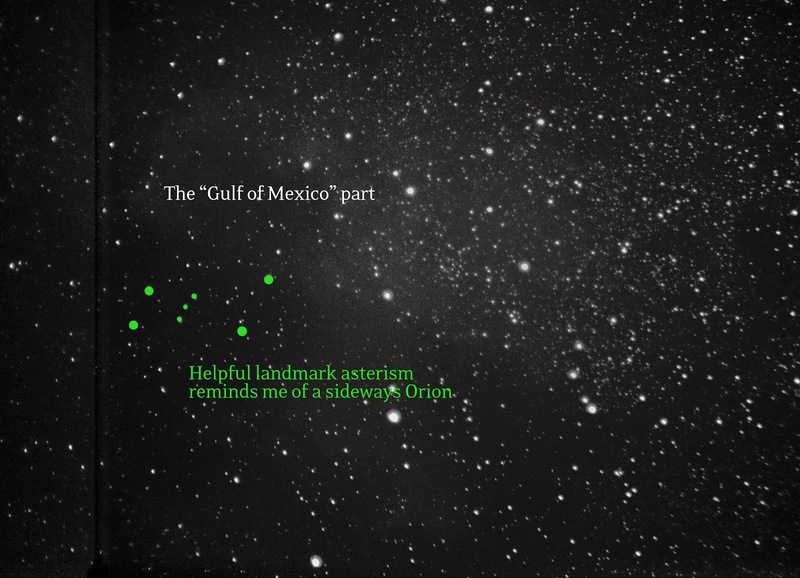 I ended up using an asterism of 7 stars to help tell if I was in the right place - it's sort of like a sideways Orion right in front of the "Gulf of Mexico" part of the North America Nebula, so that's a good spot to aim for. I had a real problem with a center hot spot in the middle, a vignette that turned the center of the image lighter gray even in the absence of actual nebula dust clouds. 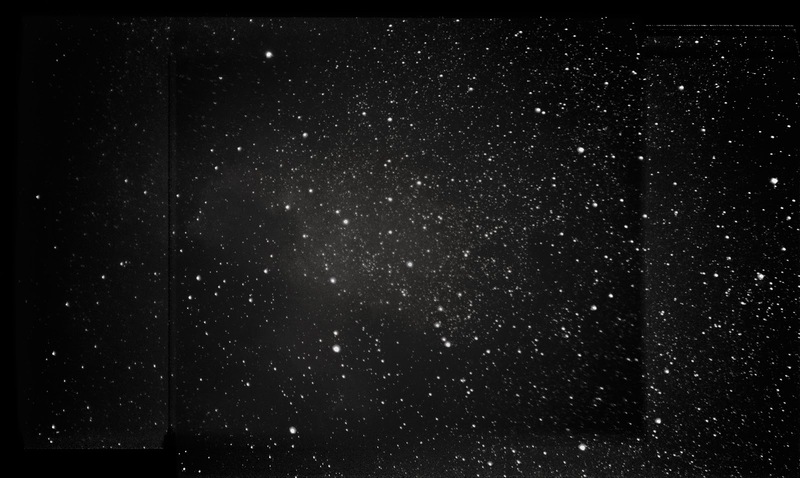 I tried to subtract this vignette to show what dust clouds are really there, but it's difficult to tease them apart. I need to do more of these to really up my processing skills. Really the three things that make a good deep sky photo are dark skies, good equipment, and processing skills -- if any of these is your weak link you can expect mediocre results. 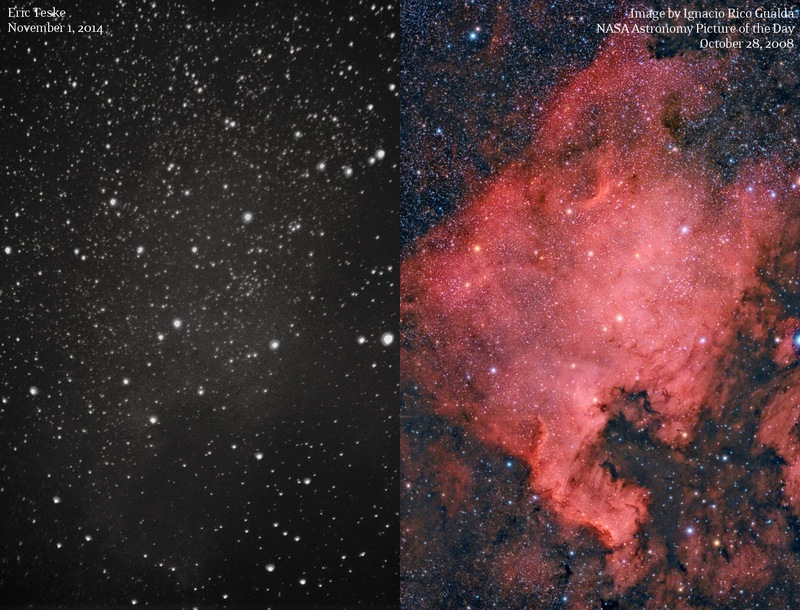 Comparison between my image and a much nicer image by Ignacio Rico Gualda shows some faint light and dark patches around the "Gulf of Mexico" portion of the nebula, and some general-ish light patch in the middle. Just barely! Next up, the Pleiades, "Seven Sisters," or M45. 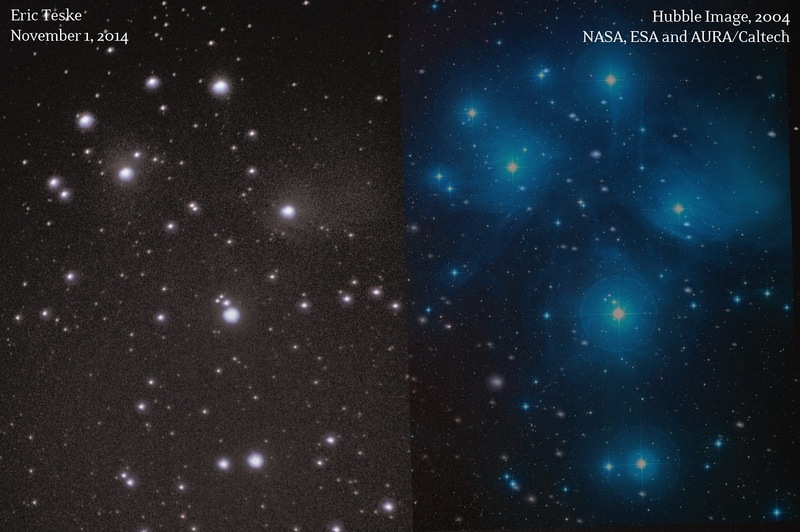 I've stacked the Pleiades before, but never really got much nebulosity. I've seen plenty of photos, always with some wispy blue clouds around the stars, but I was never sure if I really captured it or not. The stack from last night puts that ambiguity to rest, with some clear wisps in the right places when compared to a Hubble image. I had a major problem with vignettes creating a hot spot right in the center of the frame. I tried to remove the gray circle in the middle while leaving the nebulosity, but it's a bit like throwing the baby out with the bath water. So there you have it! 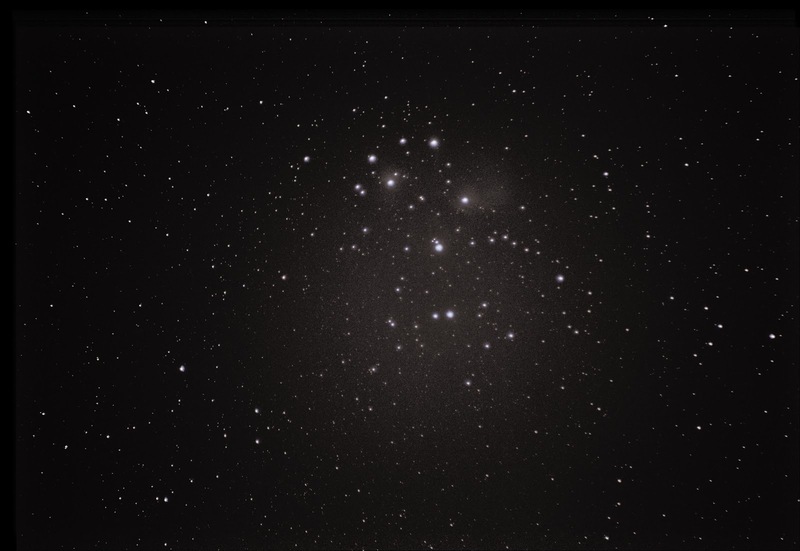 Light polluted skies in Noblesville, Indiana and some free time on a Saturday night produced some pretty faint fuzzy blobs - but when you compare to the 'actual' appearance of the deep sky objects, some faint similarities do emerge. This comparison technique helped me confirm my first Milky Way capture, so I think these objects definitely count!